4x4 @ Kungwini is an hour from Johannesburg and 30 minutes from Pretoria. 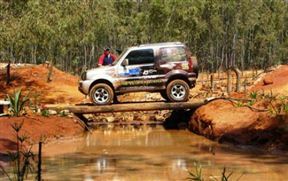 Kungwini offers 4x4 training on 12 obstacle courses. The trail takes one past the eastern-most part of the Magaliesberg through ‘koppies’ and fantastic African ruins. The trails vary from 1.4 km to 8 km. Only 4x4 vehicles may be used with low range facilities and high clearance. The trails are graded from 1 to 4. The trails are accessed all year round. The training obstacle course presents sand, v-shaped gullies, angles and 30-degree stall starts and much more! Excellent 4x4 course. Very good for training with all the obstacles nice and close to each other. 4x4 at Kungwini is 8.8km from the centre of Bronkhorstspruit , the nearest airport 51.6km (Waterkloof AFB Airport).